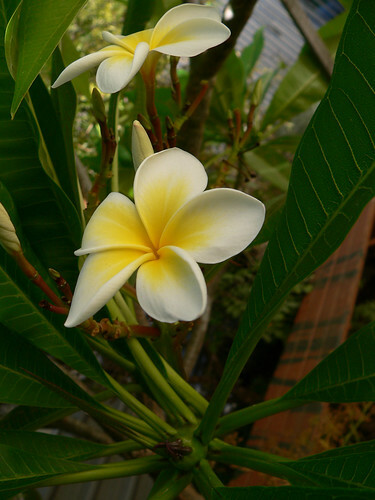 This is the last of the frangipani flowers on my tree for the season. It’s now autumn, the days are getting shorter and the nights are getting colder. Pretty soon all the flowers will drop off and then before too long the leaves will drop off and the tree will be bare until it gets warmer. When I moved into my house eight years ago, this frangipani tree was in a pot, and not very big. I planted it in the ground outside my kitchen window so that when I am standing by the sink I can see the tree, and I can smell the flowers. It will eventually block off some summer sun. They are slow growing trees but my patience is paying off and I love the smell of the flowers so. « To clean up your old blog posts, or not?